April Lee started working for L5R’s original set in 1994/5 and had art in every regular expansion and edition afterwards for nearly 15 years, and kept working irregularly afterwards–adding up to around 250 pieces of card game art. One of the images in Imperial was of Kakita Yoshi. He eventually became experienced after many sets and led to April’s fondness for pretty long-haired Cranes. But she has also painted Daimyos for Crane, Scorpion, Phoenix, Dragon, and ancestors for Unicorn, and Personalities for nearly all the clans. 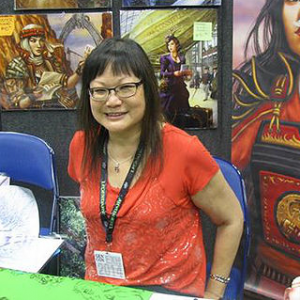 L5R has been a major part of her life and she has always enjoyed doing art for the game and meeting players at GenCons, Koteis and other tournaments.